As a Commissioner for the UK Commission for Employment and Skills (UKCES) and a vice-chancellor, I’m very interested in the contribution that universities can make to high level skills. The jobs of the future will increasingly need higher skills, particularly in key sectors that will drive the UK’s industrial strategy. We need to put a high-skill workforce centre stage, investing in human capital that not only promotes long-term growth but acts as a way of distributing its benefits more fairly. UKCES’ Working Futures study shows changes to occupational structure mean that by 2022 nearly half of all employment will be for highly skilled roles. Managerial, professional and associate professional occupations are projected to grow almost three times faster than the average for UK employment as a whole between 2012 and 2022, resulting in 2.3m additional jobs. Of those some 300,000 additional jobs are projected for STEM-related roles: scientists, engineers and technologists. Graduate employability and ensuring a good fit between those leaving universities and the job market has been a key concern for the last ten years. However, meeting the skills challenge will require us to also maximise the potential of different and non-traditional routes into higher-skill roles, particularly vocational and technical pathways, for both young people and experienced workers. These pathways will also open routes to higher paid careers for a wider group of talented people, helping to address inequalities in access to higher education. Universities have a huge role to play and the potential is significant. Within my own institution, the University of Derby, we have fully embraced the higher skills agenda. It permeates our approach to undergraduate teaching, but we have also generated dedicated Higher Apprenticeships and have taken part in their development work nationally. One notable area for us has been our work with the Institute of Quarrying to develop career ladders in the extractive industries, which are very much in evidence in the north of our county. Another area is our work specifically to develop the skills of people delivering work-based learning. Our work with SMEs in our region and our engagement with advanced manufacturing in the city of Derby has also demonstrated the 'real' impact of the statistical work undertaken by UKCES which has shown the increased primacy of skilled employment in building the future economy. • Universities UK’s recent economic impact report demonstrated how higher education’s economic outputs amounted to £73 billion of both direct and indirect effects. • The most recent higher education business and community interaction survey (HE-BCI) showed that in 2012–13 universities’ contribution through services to business and the community (as measured by their knowledge exchange income) was worth well over £3.5 billion, an increase of 4.4% in cash terms compared to 2011–12. • And, finally we’ve just had the National Centre for University and Business (NCUB) State of the Relationship report, which highlights the scope and depth of the relationships universities have with businesses. These sit alongside earlier reviews, such as that undertaken by Sir Andrew Witty, which reinforce this contribution. Significant policy shifts, such as the lift in student number controls, also reflect the fact that that government recognises growth in higher education is going to be essential for the country. I’m therefore pleased to be leading on a joint project between UKCES and Universities UK examining this issue. The project will examine where the innovative and effective partnerships are and how universities are building on the strong collaborations they already have, as well how they are forging new partnerships to stimulate and respond to demand in the economy. In addition to promoting good practice, the project will look to develop an understanding of the conditions needed to create different types of successful employer/university collaboration and the types of barriers that employers and universities face in establishing collaborative working. A report arising from this work will be published in the summer and we will keep discussion of the issues going with activities throughout the year. This work will contribute further to the evidence base outlined above, but will also seek to push things forward and further realise the benefits. For me, the key purpose of this report is very simple. We’ve got to make sure this work looks at the issues through the lens of the employer and that any learning we promote is ‘employer-focused’. Over the coming days we’ll be asking for the views of people on the ground with first-hand experience of these issues. We want to hear your views on what works and doesn’t in the current situation. If you’re working at a university how are you engaging with local employers and businesses? If you’re a business, how can universities help you? What is going well and what needs improving? 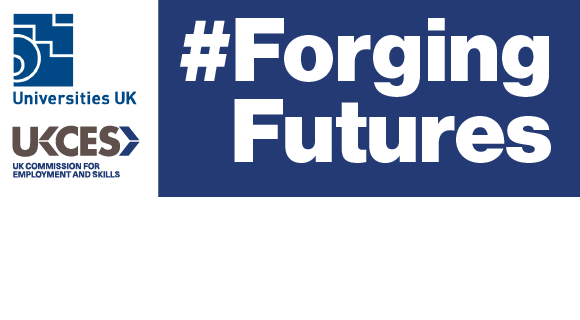 Join the debate – follow @UKCES and @UniversitiesUK and use the hashtag #forgingfutures, or share your views on LinkedIn. I would love to get involved by extending to schools particularly in light of latest DfE guidance on Careers advice and inspiration. Can I? Cardiff University has piloted this year a credit bearing optional module - Analysing & Experiencing the Workplace (with Placement) - as part of the second year Undergraduate programme within the School of Social Sciences. Students study the workplace, labour, gender, recruitment ...etc, in the Autumn Semester and are on placement with a local employer/host organisation in the Spring Semester. Higher level skills are crucial to the UK's economy. To gain a full understanding of the breadth of skills available to individuals and employers, and the diversity of delivery methods, it is important that all providers are acknowledged. It is disappointing that this blog only mentions universities. There will be many UK employers who highly value their partnerships with FE colleges to upskill their workforce, particularly to level 5 through Higher Nationals and Foundation degrees, but also at higher levels. If the debate is to be meaningful it is important that a full picture is presented and discussed. While many coleges also work in partnershiup with univerities, the expertise for design and delivery of higher vocational skills usually sits with the colleges. Hi Ann, thank you for your comment. While this piece of work focuses on links between universities and employers, we have recently published a different report on collaboration between colleges and employers - see https://www.gov.uk/government/publications/improving-engagement-between-employers-and-colleges. This was done in partnership with the Gazelle Colleges Group and the 157 Group. I hope you find it useful.